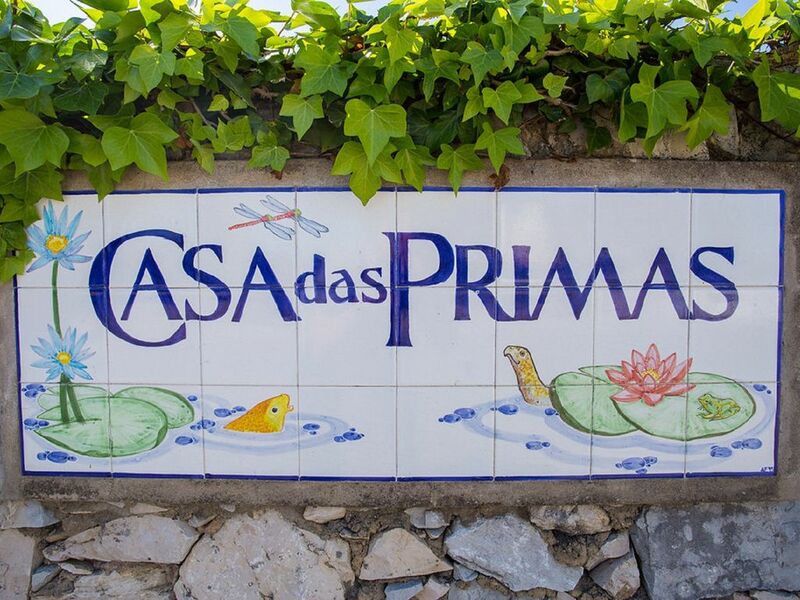 Casa das Primas can offer you a holiday in tranquil surroundings, with open views of the countryside and the sea beyond yet less than a 10 minute walk from the local market, beach, shops and restaurants. Two high-quality studio apartments with private entrances and patios are available for rental, which have recently been upgraded. Both share the architecturally designed water garden and large swimming pool. The ponds in the water garden abound with water lilies, enlivened by ornamental fish, frogs and turtles. The special Koi pond fed by a waterfall makes for a soothing and sensational holiday. We also offer you personal attention at all times, if required. Evening meals are available on request at reasonable rates if you should tire of the restaurant scene. Book early to avoid disappointment. Details of studio apartments: Each of the two apartments has a separate private entrance, and each has their own patio or terrace area. Each apartment is fully furnished and the kitchens are fully equipped with all the necessary appliances, crockery and cutlery. Casa das Primas offers their clients an outdoor secluded, shared, swimming pool with umbrellas and sun beds. A perfect setting to relax and get away from it all. There is private parking on the premises. Faro Airport is approximately a 50-minute drive from Casa das Primas. The property is owned and managed by Charles Every, assisted by his daughter, Vanessa de Beer. Car Hire, taxi transfer & local information. : For guests wishing to rent a car, there are a number of local car hire firms offering very competitive rates, with efficient and personal service. You can collect your car at Faro Airport. A taxi can also be reserved from Faro Airport to bring you to Casa das Primas. The cost is approximately 80 Euros, however alternative arrangements can be made should you require this service at a cheaper rate. The journey usually takes approximately 50 minutes. . There are over 100 restaurants/bars in Carvoeiro and surrounding areas. A mini market 100 metres from Casa das Primas can supply all the basic requirements. There are a number of excellent walks around the cliffs and village. Casa das Primas is very centrally situated with easy access for any activity. The villa is extremely quiet and peaceful in spite of its close proximity to the centre of Carvoeiro. Area Description and sport: The Algarve is a region renowned for its wonderful sunny climate, miles of golden pristine beaches, either long stretches of beach or intimate little coves with stunning rock formations. The sea is azure blue and mostly clear. The Algarve has an average of 3000 hours of sunshine per year. It has virtually no rain during the summer months. February is the start of spring, with October being very mild and warm. The Algarve has many sporting attractions. Golf is a very popular sport, as well as many water sports, tennis, horse-riding, walking and biking. . Water parks, Zoo marine, and the historical castle in Silves are all 10 - 30 minutes away by car from the villa. My father bought this house in 1969, since then he has watched Carvoeiro grow and change. The original house itself, has also changed and my husband and myself arrived here from South Africa some 15 years ago. I am a Home Economist by profession and still practice my skills in the Algarve. We live on the property and so are accessable to clients most of the time. The property is very quiet with a lovely greenbelt in front of the garden and sea views from the swimming pool and the Penthouse apartment. The great advantage is its a short walk into the village and there are many restaurants and bars to choose from which can make for a great night out. The beaches in the area are very picturesque and are very easy to access. For the more adventurous, the apartments are within easy travelling distance to the East and to the West Coast along with an easy car ride to the Monchique mountains to the North. Perfect accommodation for two people, who want semi- privacy. Not being in a vast apartment block sharing a swimming pool with a large number of people is a distinct advantage. The swimming pool is shared with the other apartments but it is still quiet and calm. The apartments are self-catering which again means eating either in or out, everything is provided to make meal preparation and eating easy. Toilet, shower enclosure, electric heater, small patio off bathroom, outdoor shower at swimming pool. Through air conditioning system. Electric blankets supplied. Situated in the laundry area, ask owner for instructions for use. The clothes dryer is situated in the laundry room which is separate to the apartment. Either in the driveway or across the road plenty of safe parking available. Hand and bath towels provided, beach towels need to be supplied by the client. Full size refrigerator with separate freezer on top. A few basic items are available, such as salt and pepper etc. Fully equipped can serve up to six persons with crockery and cutlery etc. most people dine outside on the patio, but inside can comfortably seat three persons. Through internet, English television programs and some local stations. Television is run through the internet. A large variety of books are available. The garden is terraced, and has a large section of natural rock which has been turned into a number of ponds which have fish, turtles and water lilies. Two balconies which have views over the garden and to the sea, and inland to the Monchique mountains. It has an umbrella and an awning which is retractable. Uncovered, it has views to the Monchique and over the water gardens and swimming pool to the sea. Nearby at Val do Milho a 9-hole course. Otherwise a little further away is Gramacho which is an 18-hole course. The pool is a short walk from the apartment as can be seen on the photographs. It is fairly secluded from view from the other apartments and main villa. There is a Snug alongside the pool. Just home from what I can say was the best holiday ever. Our penthouse apartment with those views were beautiful. It's like home from home with all u need from a home baked biscuits on arrival to a hair drier. Fluffy towels spotless shower room. 3 balconys with a large bbq on one. Would highly recommend this wee diamond and cannot wait to go bk. Thank you so much for your kind words, we really enjoyed having you stay with us, and hope you return again sometime in the near future. Wonderful, bright, spacious, penthouse apartment with beautiful gardens and fantastic views to the sea. Vanessa and Terry are wonderful hosts where nothing is too much trouble for them. Can't wait to go back again. Great apt good size good spacious terraces with views to sea. Fantastic relaxing holiday will definately go again. The little fishing village of Carvoeiro is situated in the middle of the Algarve, well positioned for some of the best beaches, and sight seeing trips to the north to the Monchique Mountains, or to Faro in the East and Sagres in the West. It is an easy one-hour drive in each direction. The nearest large towns with great night- life and marinas are Portimao, about 8 kms away and with Albufeira a short 30 minute drive away. Zoo marine and Water Parks can be reached within 10 – 20 minutes. Golfers will find the area a paradise. The Algarve has historic buildings and museums, fabulous countryside and barely-explored areas of coastline, an up-and-coming food and wine scene, and perfect conditions for all sorts of special interest travel, from painting and photography to adrenalin adventure and sports training.There are so many activities to explore by day or night! Golf: Golf is a very popular pass-time, with about 50 golf courses along the approximately 160 km of coastline. Most of the golf courses are within a 45 minute drive of the studio. The Portuguese Open has been hosted at the Penina, Vila Sol and Sao Lourenzo, all of which are top European Championship Courses. The championship course of the Penina which was designed by Sir Henry Cotton, is about 12 kms, away with Gramacho and its sister course, Pinta, a short distance away from the studio apartments in Carvoeiro.Around the corner from the villa is the Vale de Milho nine-hole golf course, one of the few, which does not have a handicap requirement, making it an ideal place for budding champions. Whatever your skills there is always a course for you to play on. The Algarve is renowned for its standard of greens, for all-year round play at competitive prices. Rental charges are for 2 persons in a self-contained studio apartment. A cot can be provided at 20 euros per week. There is full use of the swimming pool at the users own risk. Tenants are fully responsible for breakages or damage. 30% deposit required when making reservation. Deposits can be paid in pounds and directly into our UK/Portuguese bank. KINDLY NOTE, DUE TO HOME AWAY CHARGING 3% ON DEPOSITING YOUR PAYMENT TO ME, I HAVE HAD TO INCREASE THE WEEKLY RATE TO INCORPORATE THIS FEE.